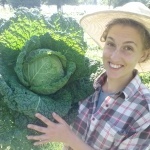 Field Notes Farm Community Supported Agriculture — Sign up here! Starting in 2012, we organized and built a nonprofit farm and CSA program in Appleton, WI. In 2014, the CSA program we managed reached 200 members. We learned from our experience building a big program that we love the CSA model and all of the connections it brings. This is our fourth season in Custer, WI running our CSA as Field Notes Farm. We are excited to focus on creating a more intimate community program with fewer members (up to 75 shares for 2018) and greater opportunities to build relationships. When you join our CSA program, you become a member of our farm. In exchange for your support of our farm, we produce fresh, high quality vegetables and herbs to include in share boxes that you will receive weekly (or every other week) from mid-June to mid-October (18 weeks) or through mid-November (22 weeks). Picking the right size share is important. Generally, if you and/or your family enjoy vegetables and cooking at home, then an every-other-week share is appropriate for 2 people, and a weekly share is appropriate for 4 people. If you cook every meal at home and have a vegetable based diet, then 2 people can eat a weekly share. If every-other-week is not appealing, or you are a single person, then you might consider splitting a share with a friend or neighbor! Each box includes 4-6 staple vegetable items such as carrots, lettuce heads, tomatoes, snap peas. This is the perfect introduction to a Community Supported Agriculture program. You will receive all the benefits of being a member with an extremely reasonable amount of food for a household transitioning to more fresh produce. If you are a smaller household or prefer just the simple basics, this share will also provide the right quantity and flavor. Maybe you find it hard to get to the Saturday morning market bright and early or maybe you are looking for an economical way to get fresh produce — this is for you! After the main market is over, you will get to pick up YOUR CHOICE of items from market leftovers to fill a 3/4 bushel box on Saturday afternoon. We plan to set aside a few crowd favorites (a pound of snap peas, a pint of cherry tomatoes, etc), so you will get those as well. If you love to do food preserving projects, this will also be a fun way to stock up on items when we have an abundance of them. We love dedicated Saturday morning market shoppers! If you love coming to market and picking out items, we have created a way for to still support the early season of our farm. You can purchase a market card to use over the course farm market season. (Don’t worry, you can reload it if you need to.) Because of your early investment we will give you a 10% discount for the value of items you purchase at our market stand. We are able to load the cards from $100 up to $10,000, so you have the flexibility of how much to commit. We promote soil fertility through careful crop rotation, extensive use of cover crops, and the addition of nutrient-rich compost to our growing beds. We use drip irrigation to conserve water and protect against the risk of drought. We use 5 high tunnels (passive greenhouses) to increase the quality and yield of high value crops while protecting them from inclement weather and extending the harvest season. We plant and maintain pollinator and beneficial insect habitat to promote a healthy farm ecology and buffer against the risk of pests. Our growing practices respect the farm as a complex system. We strive to learn new lessons and make new improvements with each growing season. We are certified organic! We use 100% certified organic & non-GMO seeds and inputs, and use no chemical fertilizers, no herbicides, and no pesticides (not even those permitted by USDA organic standards). We grow dozens of varieties of vegetables and herbs. A full list of the varieties we plan to grow for the 2015 season can be found in the data section under Seed Order and Planting & Yields. We strive to balance familiar and unfamiliar vegetables in our CSA shares. Some member favorites that we try to include frequently include: carrots, lettuce, onions, tomatoes, and peppers. We also include tasty but less familiar vegetables for you to try, like celeriac, golden beets, salad turnips, and chard. Participating in our CSA program is a great way to learn about incorporating more vegetables into your weekly cooking routine. We love to cook and eat the vegetables we grow, and will always include recipes and serving suggestions with each share and in an archive on our website. The beauty of the CSA program is that you will receive a different share each week! The first shares will include lots of greens and roots that thrive in the cooler spring whether. You will see an evolution in the size and diversity of your shares, starting with lighter boxes in the early season and progressing to the larger and heavier offerings of midsummer and fall. When you join our CSA program you agree to share in both the bounty and risks of the farm. We are committed to providing delicious, high quality vegetables to our members each week of the season. However, each farming season comes with uncertainties. Extreme weather events, pest infestations, and crop diseases are all risks to any farming venture. It is possible that one of these issues could influence the quantity of vegetables we are able to distribute to members. If this is ever the case, we are committed to communicating fully with our members about the situation. We design our farming system with a focus on diversity and resiliency in order to reduce the impact and likelihood of crop failures in any given year. On the other hand, when we do well, you do well. When you become a member, you provide the financial support we need to get the season started. At the end of a good year your investment has provided a stable foundation for our next season. The financial stability of the farm allows us to continue to provide high quality food to nourish your household. In general, we do not allow cancellations or refunds for CSA shares. By signing up for a share, you are making a commitment to Field Notes Farm for the growing season. We are willing to consider exceptions on a case-by-case basis, please contact us to discuss further. We believe that a healthy CSA community is founded on clear communication, and hope to develop relationships with each of our members. We have chosen to make all of our planning, budgeting, and record-keeping documents for the farm available on our website as a way to share the inner workings of the farm with anyone who is interested. As a CSA member, we encourage you to explore our website, ask us questions, and give us feedback about your experiences with our vegetables and CSA program. If you would like to visit the farm, call or email to set up a time. To sign-up: fill out our CSA Sign-up Form! The sign-up form includes the nuts and bolts information about CSA logistics and payment. After you sign up you will receive a confirmation email with a copy of your sign-up form and a payment reminder. We are offering up to 45 shares and 10 workshares for the 2017 season. Your share is not reserved until you have submitted payment. You have 2 weeks (14 days) from the day you sign up online in order to submit payment. If you would like to arrange an alternative payment plan, please contact us to discuss. It is your responsibility to pick up your CSA share at your site during the designated pick-up times. In the event that you are unable to pick up your share on a given week, it is your responsibility to find someone else to pick up your share. Unclaimed shares will be given away or donated to a local food pantry. If you are unable to find anyone to pick up your share, please contact us BEFORE the pick-up day to cancel your box for the week. **Please note that your shares are not refrigerated after they leave the farm. The sooner you are able to pick up your share and store the contents in your refrigerator, the longer your vegetables will last! We include storage tips for everything included in your share.